For a long time I knew that Samson Schiff had only two children: Wilhelm, and his younger half-brother Friedrich, my great great grandfather. I knew most about Wilhelm because my grandfather's half-brother, Umberto Schiff, was in contact with his cousins, Wilhelm's two unmarried daughters, Guglielmina and Sofia, who spent their latter years in Trieste. Then two years ago I discovered that they had a sister Paulina, about whom a great deal is now known thanks to the researches of Dr Ruth Nattermann. This led me to discover five other children, thanks to a document in the Milan Hewish archives dating from 1859. There names are given in Italian, the girls being Augusta, Frida and Ottavia, and the other brothers being Lodovico and Alberto. I have found a possible marriage for Ottavia in Genoa, but nothing else. 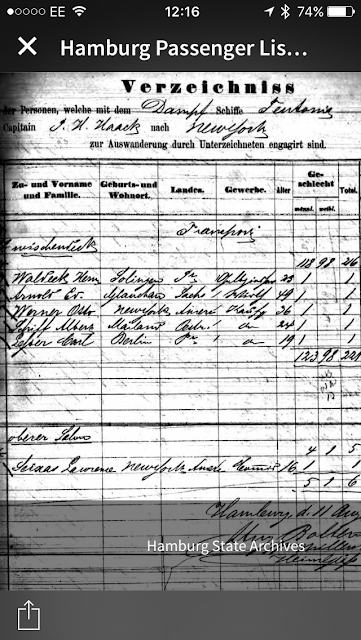 Then last week, whilst in hospital, a search revealed that Albery Schiff from Milan sailed from Hamburg to New York in 1866, aged 24, undoubtedly my uncle. I have found no further trace of him though after his arrival in America. "Victoria: The Enduring Legacy of Lady Alexander"